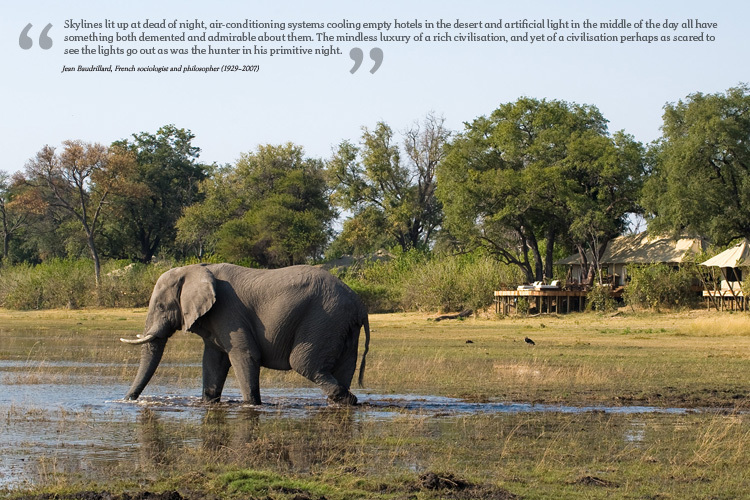 This quote is pertinent to the central questions we have posed repeatedly in this book: how much luxury and comfort do you need on safari, and how do you provide that while inflicting the least possible damage on the natural environment? Here is what we consider the core ingredients that go into making the ultimate green lodge located in a prime wildlife area. While this lodge does not actually exist, we hope that in time all safari lodges will strive to implement these and other sustainable practices. It’s a big topic and could even be the subject of a book of its own. Perhaps this will be the prompt, for others with more expertise than ourselves in the field of rapidly evolving and improving “alternative” technologies, to explore, improve and expand on the topic in much greater detail. We can only present the sum total of our collective knowledge in point form of what we believe every lodge should be and do, or strive to. The first step in getting it right: a new facility needs to be designed and built to blend into the natural setting, minimising any site damage, and installing the latest technologies to ensure minimal impacts. Design, scale, décor and style of the lodge should be appropriate to the area, the immediate surroundings and the culture of the local people. There should be creative use of materials and recycling – in other words, make use of what is on site or available in the area. The facility should preserve the natural integrity of the place and introduce nature to the guest’s experience (decks, wide-open view sky beds) and not introduce inappropriate trappings of the city to the bush. Lodges should be designed to withstand the climatic conditions of the region and meet the expectations of guests when it comes to comfort and safety. The facility should be able to be completely removed at the end of its life or lease in order to allow the bush to revert to its natural state. There should be minimum use of cement except as floors in workshops and fuel depots to prevent spillages from polluting the soil. Canvas or sustainable, local materials should be used wherever possible. A lodge should be built with ample insulation to keep the rooms cool in summer and warm in winter. Nowadays canvas is available with double insulation layers for walls and roofs. No hardwood should be used unless it is old and recycled (such as railway sleepers and old boats). If the lodge requires hardwood for decks, for example, consider Rhino Wood, a new product that creates a hard product from softer commercially grown timber (www.rhinowood.co.za). Alternatively, look at artificial woods such as Eva-Last (www.eva-last.co.za) or that age-old “new” wonder product bamboo. For screens, walls and roofs, use sustainable and easily renewable materials such as canvas, grass, reeds and palm makuti. No animal products (such as porcupine quills, zebra skins, etc) should be used for decoration unless you have proof they have been collected sustainably over time and on site. No charcoal or local hardwoods to be used for heating water or cooking; only a small amount of wood should be used for the evening’s social fire. As much as possible should be purchased locally. Wherever possible, fresh organic vegetables should be grown by local communities and purchased from them. In addition consider hydroponics. Produce must be from sustainable sources. These include certified timber, certified fish and certified palm oil, for example. All unsustainable practices and endangered products must be eliminated from the supply-and-value chain. The kitchen must be designed so that it can be easily and hygienically cleaned at all times as well as being kept cool with effective insulation. There should be washbasins and handwash liquid dispensers at all entrances. Correctly sized grease traps must be installed at all kitchen drains. They must be cleaned regularly: use “grease trap tabs” (www.eco-tabs.co.za). Use organic menu ingredients preferably sourced from neighbouring communities, such as from the COMACO scheme in Zambia (www.itswild.org). Use environmentally sensitive cleaning materials. Cook on bio-gas produced from the lodge’s own bio-gas facility. Borehole water should be pumped by means of a solar pump. Water usage meters should be located at strategic points to measure the amount of water being used and to help with the early detection of leaks. Recycling plastics in rural Africa is a problem, so the use of plastic water bottles should be eliminated: rather produce adequate potable water on site. Drinking water should be created by filtering local water to remove all sediment and then UV radiated to eliminate any remaining bacteria. These water purifying machines are neither bulky nor expensive. A small filter system for a bar and dining room costs less than US$1,000 and will quickly pay for itself. Water should be provided to guests in personal water bottles so the lodge no longer has to purchase, transport and supply potable water in plastic bottles. The price of solar systems has plummeted while the cost of diesel has escalated. There is therefore no reason to delay converting from fossil fuels to solar for all a lodge’s electricity needs. 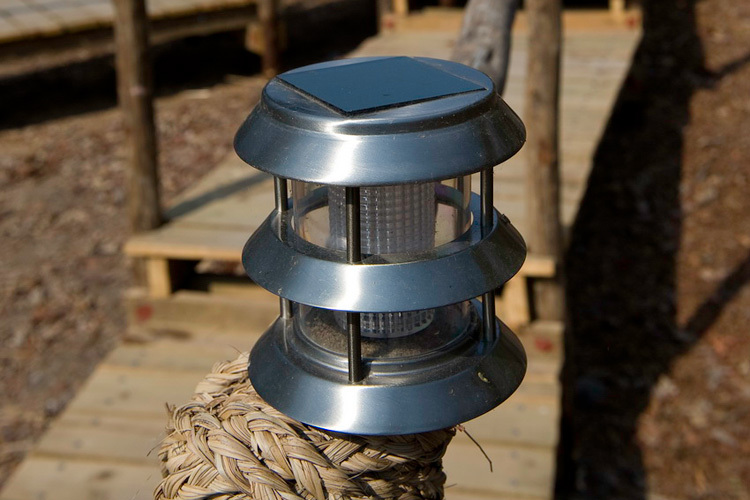 Electricity created by the sun is stored in a bank of batteries to provide 220 volt power at night and on cloudy days. New German Hoppecke deep-cycle batteries are guaranteed for 15 years and need servicing only every five years. Bosch says its photovoltaic panels will last 50 years; it guarantees them for 25 years and the panels now cost €1.20 a watt. In 2005 the best solar panels cost US$7 a watt. Chinese-manufactured panels cost less than US$1 a watt. Financing is available from many banks so there is therefore no financial reason why every lodge in Africa should not be converting to solar. Efficiencies have improved to the point where solar can now even run air-conditioners (http://sinkoilassociates.yolasite.com). Wind turbine efficiencies have improved marginally over the past years. In areas with regular winds, wind turbines can supplement electricity requirements (www.kestrelwind.co.za). The lodge’s existing generators should be used only as a backup in emergencies. Bio-diesel should be used to fuel emergency generators. Evening Breeze is an aircon system made in Holland that uses very little energy – between 170 and 600 watts at peak use, which is no more than an ordinary fan. The system covers the bed area only to keep guests cool at night (www.evening-breeze.com). Electric geysers and wood-burning “donkey” boilers are not sustainable and should be replaced by solar hot-water heating systems which are highly effective, especially those using evacuated tubes. If a lodge is upmarket and boasts baths (and you are in an area with lots of water), two solar geysers can be plumbed in series to ensure a constant supply of hot water for even the mega-user guest. In areas where there is a lot of shade, a thermodynamic Energie hot-water heating system (www.energie,co.uk) can be installed. It produces hot water in the shade and even on cold and overcast days. A low-energy alternative is a heat pump, but this is not quite as green as solar. This is possibly the safari tourism’s single biggest oversight, as many lodges pollute their ground waters. Rivers in Kenya’s Maasai Mara Reserve are poisoned by human (lodge) waste due to a lack of effective sewage systems. Correctly engineered above-the-ground sewage or grey-water systems are essential to just about every green lodge. These plants ensure that all waste water and sewage is processed efficiently, resulting in pure, clean water flowing back into the environment. A Calcemite Bio-mite tank system, flowing into an appropriately engineered artificial wetland that purifies the water, is a possible retro-fit alternative, but should be avoided in new lodges (www.calcemitetanks.co.za). Some lodges have opted for waterless, composting toilets. Some use earthworms to break down waste (www.wormsloos.com.au/plans&parts.htm). MacGyvers can build their own compositing or worm toilets (www.omick.net/other_toilets/other_toilets.htm). Eco-tabs can be used to reduce odours and help break down waste (www.eco-tabs.co.za), but not if you are using worms. Start with a careful purchasing policy – and then reducing, re-using and recycling whatever waste can be. Have a clearly defined waste management policy that all staff sign-off on and that is rigidly adhered to. All waste is to be sorted and then safely stored before being trucked out of the area for safe disposal. There should be a fenced area with clearly marked, lockable, animal proof (especially baboon, rat and hyena) cages or bins for storage prior to removal. No waste is to be dumped at the back of any lodge; a clean back-of-house is a critical component of a well-run lodge. Grease traps and macerators are essential to ensure kitchen waste does not clog up the grey-water system. All leftover food can be recycled and processed by the lodge’s bio-gas system, which produces methane gas for stoves, or used for compost. Efficient incinerators are needed to efficiently dispose of any other combustible waste; they can double as boilers to heat water. Safari operations should strive to expand existing protected areas by creating buffer zones around game reserves, working with communities to form viable wildlife conservancies. Lodges should support bona fide researchers. They should, where possible, conduct a regular wildlife census and share this information in order to build a clearer picture of what is happening to wildlife numbers. They should strive or help to reintroduce and protect endangered species. The operation should investigate local and regional conservation priorities and how it can become involved; who is already working in the area and how partnerships can be formed. Promote guest buy-in by encouraging donor funding, volunteer work or other forms of assistance. Employ the best guides so that guests learn from their safari while having fun. Have a corps of trainee guides who work under a mentor and are put through regular training and learning programmes. All guides should be made to read and sign-off on the principles in Garth Thompson’s excellent book The Guide’s Guide to Guiding. Staff are the key component that can make or break the reputation and smooth running of every lodge. Every effort should be made to ensure that staff members are content and motivated, so that they are productive and willing. The best way to ensure staff buy-in is with a share incentive scheme so that staff own a portion of the lodge via a communal trust. Staff should ideally be recruited from neighbouring communities and the region so that the community closest to the wildlife resource can enjoy the benefits and grasp the link between prospering wildlife populations and their own prosperity. They should be housed in comfortable and clean conditions, with well-appointed facilities. In areas with dangerous game, staff villages should be fenced. A staff kitchen must provide nutritious, well-balanced meals using quality ingredients; one daily 50g serving of e’Pap added to the normal staff menus will ensure they enjoy a healthy balanced diet. Staff should receive regular on-the-job training and skills-transfer opportunities. There should be ongoing selection of suitable candidates for the in-house management training and mentoring programme. Community development projects should include education, health, nutrition (including supply of fresh water), family planning and women’s empowerment. Effective in-house training and up-skilling ensure local employees are able to advance themselves. Buy from community businesses and micro-initiatives, such as organic vegetable farms and local transport entrepreneurs, for example. Shun the inexcusable practice whereby dodgy safari operators lease land from a community or park authority for a bed-night fee with no minimum annual lease or rental payment. Without a guaranteed minimum rental the operator takes no financial risk and in times of poor occupancies communities earn insufficient revenue. They are then forced to look at other means to feed their families, which often results in livestock or crops being introduced to the area at the expense of wildlife. Possibly the most important recent conservation successes coming out of Africa are community conservancies, which protect the wildlife of the region while simultaneously uplifting impoverished local communities. Successful conservancies and contractual parks, such as Namibia’s CBNRM, South Africa’s Makuleke extension to Kruger, as well as Kenya’s Olare Orok Conservancy and the Northern Rangelands Trust, are all excellent models to emulate. Communities need to be formally and meaningfully brought into the tourism industry or wildlife areas will struggle to survive the current human population explosion. Wherever possible, time and effort needs to go into creating initiatives to form community conservancies around formally protected areas or expanding the areas under formal conservation protection to act as buffer zones. Lodges located within formally protected areas need to have substantial community outreach initiatives beyond merely paying park fees or leases and perhaps helping with a classroom here and some good PR window dressing there. Many lodge owners would be surprised to find that their guests would be happy to pay more for their accommodation if they knew it was going to a good cause like supporting a conservancy, a clinic or a school. Many parks in Africa protect only the dry-season ranges of wildlife: conservancies are needed as buffers between a park and its neighbouring community, as well as to help protect the wet-season migration ranges of the local wildlife. If a lodge leases land or is otherwise involved financially with a community, its payments should be made to a trust that represents the broader community. Cheques should be handed over at special community events so that everyone knows how much money is being paid and to whom to ensure the money is wisely spent. There needs to be a clear wildlife disturbance policy and off-road protocol that will minimise impacts while still offering guests a rewarding experience. These protocols should include a sensible off-road driving policy and use red filters on spotlights for night drives (taking care not to blind animals with spotlights). No hunting should be the rule, hunting and photographic safaris do not mix. Lodges should offer as large a range of low-impact activities as possible. Activities such as walks, horses, cycling, hides, mokoros, canoes, sleep-outs and birding often offer a better experience without the same impacts as vehicles. If fishing is an option, catch-and-release should be the policy, with hook-and-cook only under predetermined circumstances and only for personal consumption. The preferred ethical method is fly-fishing with barbless hooks. Eliminate the mindless “ticking off the Big Five” mentality and rather focus on offering well-paced, rewarding, all-round nature activities. It is not surprising that birdwatchers often spot more leopards than others. And it goes without saying, do not feed or disturb wildlife. Use new or relatively new vehicles and boats that are well maintained and serviced regularly. Grove Boats in Switzerland makes completely electric cruise craft (www.grove-boats.com). Don’t overload a vehicle and be sure to reduce loads after it has rained. Use a bio-diesel mix in your fuels and tank trays to prevent spillage. Use only 4-stroke boat engines; 2-stroke engines pollute and are noisy. Make sure that the boat’s engine is the correct size for the boat and its cargo; too small an engine often causes more wake and damage than a larger engine. All vehicles should carry a natural history reference library (including comprehensive field guides) that should be shared with guests. Carry spare binoculars for guests as well as comprehensive first-aid kits. Enter water, muddy and sandy stretches in the right gear and in 4×4 drive to avoid ploughing up the road. Limit off-road driving (where this is allowed) to major sightings and on only one track. Old engine oil can be used for treating wood against termites and borers; the rest should be trucked out for safe disposal. Do not give sweets to kids – rather take a pack of pens and writing paper if you wish your gift to be more productive. Donate to the lodge’s community and conservation projects if they appear sound. If you wish to sponsor a rural project, focus on education and nutrition; e’Pap is the most nutritious and best-absorbed food supplement around and, best of all, it is relatively inexpensive. US$2,000 will provide a class of 30 youngsters with all their daily nutritional needs for a full school year (www.epap.co.za). Payments from guests should be paid ultimately into bank accounts within the country in which the lodge is located. To do otherwise is akin to money laundering. Donate to an effective wildlife or community NGO working in the area. This is a list of some of the better ones. But most of all, travel to Africa’s safari areas and spread the love along with your much-needed foreign currency.